Anjali Ashram, a Catholic spiritual organization in Mysore is established under the guidance of Swami Amalorananda (Fr. Duraiswami Simon Amalorpavadass). Find out more about this ashram in Mysore. Gavi Gangadhareshwara Temple or Gavipuram Cave Temple in Bangalore is a great example of an example of Indian rock-cut architecture. 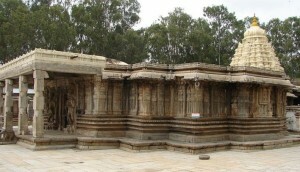 Read on to know more about this temple in Karnataka. Vishwa Vidyapeeth is one of the reputed schools in Bangalore. The curriculum at this school is developed by academic experts keeping in mind the standards of various boards of education. Shri Shaktidarshan Yogashram, an ashram in Mangalore, is dedicated to offering meditation, yoga and other activities related to yoga. Find out more about the architecture, facilities and social initiatives taken by the ashram. Shri Sridhara Swami Ashram, located in Shimoga is a perfect place to rediscover your inner self. Find out more about the facilities and how to reach this ashram in Karnataka. Talakadu Panchalinga Darshana comes around once every twelve years. The temples worshipped on the day are, Sri Vaideshwara, Sri Maruleshwara, Sri Muduhuthore, Sri Arakeshwara and Sri Pathaleshwara.